Since another fine summer is almost over it seems appropriate to simply sail off into the sunset on Daedalus. She is a beautiful yawl rigged vessel based at Bear Point Marina, Orange Beach, Alabama. You may remember the story of “Daedalus”, an Athenian craftsman famous for his ability to invent and build things. It is an intricate story but most will remember that he is the guy that invented feathered wings held together with bees wax. To escape the wrath of the angry King Minos Daedalus and his son use the wings he invented to sail off. Despite stern warnings, his son, giddy with excitement, flies too high and the warmth of the sun melts the wax holding the feathers on the wings. Down his son goes into the sea where he drowns. There is a moral in there somewhere but I have yet to find it. 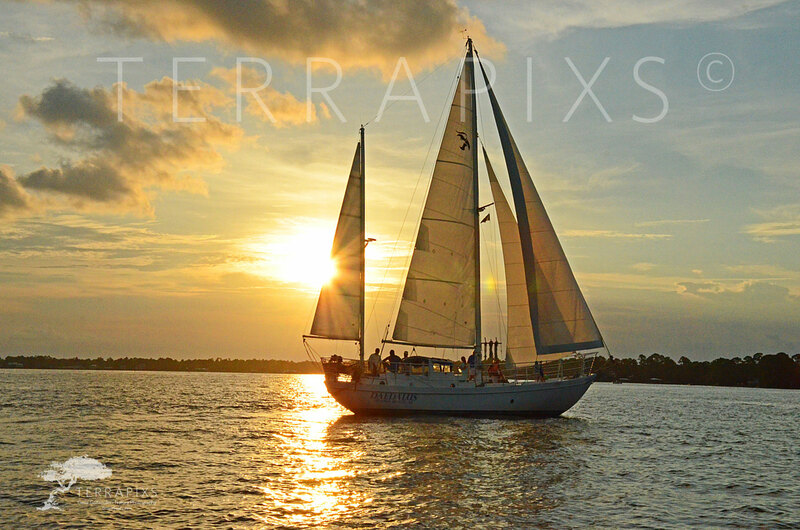 Daedalus is sailing on Perdido Bay, a beautiful estuary system that borders both Alabama and Florida. During the summer months Perdido Bay is awash with boats of all sizes and a great many jet skis. It is a family place that many enjoy. All along the Gulf coastal states we find estuaries fed by river systems and subject to tidal fluctuations. These are the nursery grounds for a host of marine species and numerous types of birds. So, estuaries are a critical link in the coastal ecosystems and keeping them healthy is vitally important. Those good sea foods we all love to eat are dependent, one way or another, on estuaries. Enjoy the last days of summer 2016 and look forward to next summer with a smile!